When I decided to expand from day hikes to backpacking and going on long distance trails, the next logical step was to decide where. Living in Albany, New York, there were plenty of lengthy trails nearby to choose from. 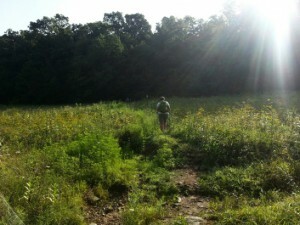 The Long Path, Northville-Placid Trail, even the Finger Lakes Trail are right in my own state. 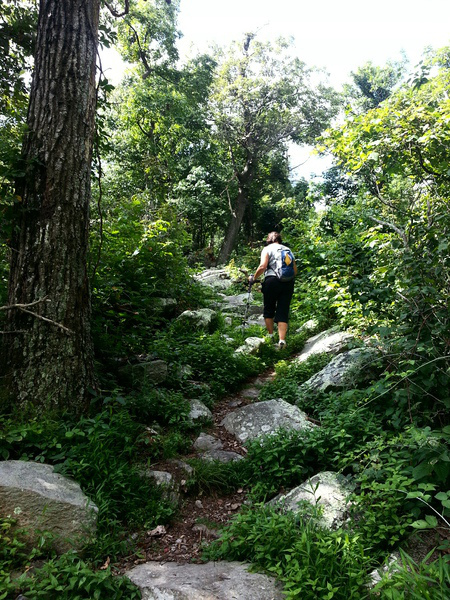 Yet after much research, a multitude of factors tipped the scales to make the Green Mountain State’s pride the best choice for my maiden trek. 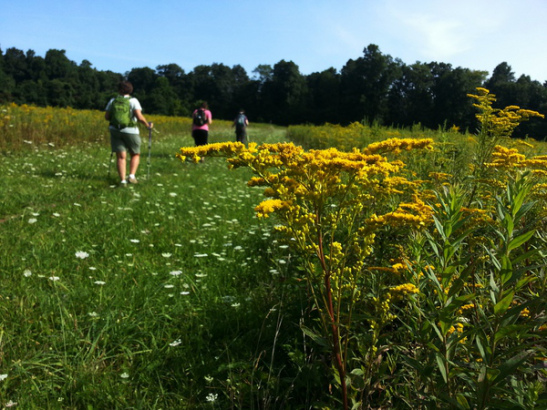 It’s the oldest long distance trail in the United States. That held a certain appeal to me. I am fascinated by the things of old. The pyramids, ancient trees, even historical buildings and artifacts. The oldest of the trails? No brainer. Easy bail outs. Because the first half or so of the Long Trail is shared by the Appalachian Trail, it seems that “civilization” is but a short walk off the trail. With my lack of experience on long hikes and overnights in the woods, having that quick escape if necessary is a prudent choice. Trees. Lots and lots of trees. Having grown up in the northeast, I am used to seeing pines, hemlocks, and birch trees everywhere. On my day hikes in the Catskills and Adirondacks, I find great calm and joy being surrounded by the trees and fallen leaves. Compared to the Southwest, where I expect to find sagebrush and cacti, which have their own enjoyment and appeal, the beautiful greens of home will provide a comfort to me that will be appreciated on that first trek. Water, water, everywhere. It’s been written that to find water on the Long Trail, one only needs to look down. Some people report that rain is a near constant (as is mud), while others claim that to be exaggerated yet agree it is a wet trail with frequent water sources. 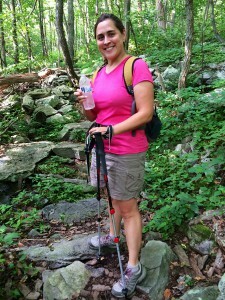 I carry a hydration bladder and three ways to purify water. Gaining experience with plentiful supplies will be most appreciated before I venture to the more difficult routes just as the John Muir or Arizona Trails. The high peaks. One of my goals on my bucket list is the Northeast 111, that is, the peaks above 4000 feet in New York and New England. 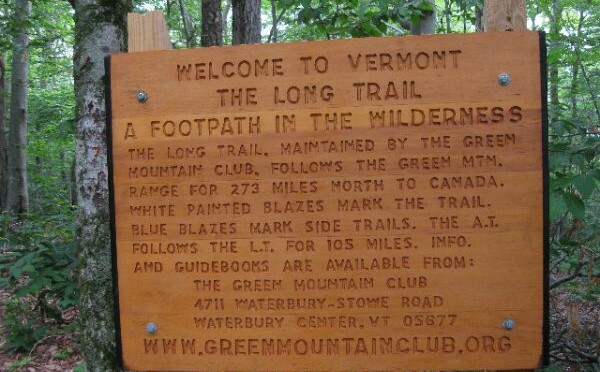 All five of Vermont’s 4000+ footers are on the Long Trail. My plan is to hike northbound, taking the first half of the trail on my first attempt, then going back another time to complete the trek. The five high peaks are in that northern, or second, half. My goal is that my body will be in better shape to achieve that feat when the time comes to face that second part in the future. Population. 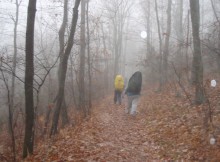 Unlike some trails where it is easy to go days without seeing another human being, because the southern part of the Long Trail is also part of the Appalachian Trail, it is a popular route with many hikers. 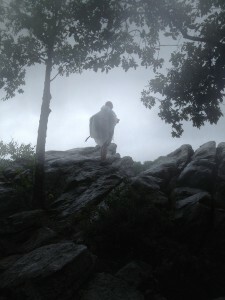 As a solo hiker, there is a comfort in knowing that if something were to happen and I was not able to activate my personal locator beacon, someone would eventually come back and be able to provide assistance. 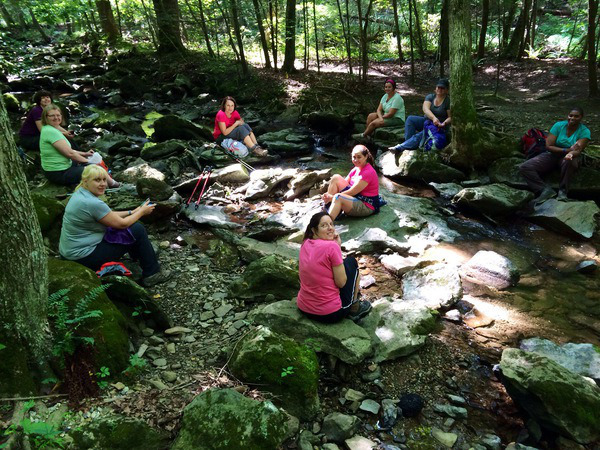 Last winter, as I sat in my comfy chair, cat on my lap, dog at my feet, and a cup of hot coffee within reach, I began to plan the AT Summer Series. 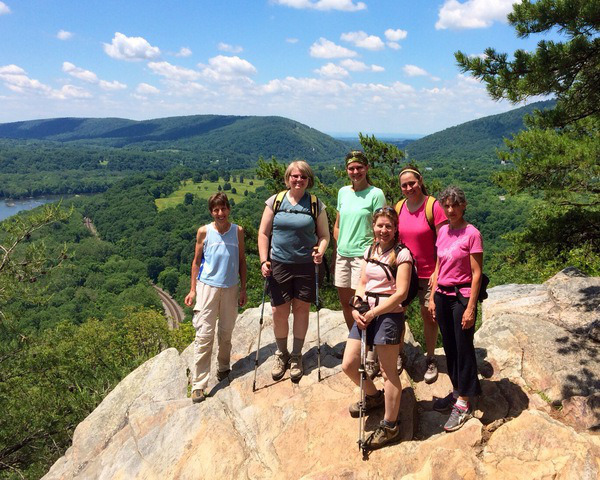 Having completed the AT through Maryland twice, once in a series of day hikes and once as a backpack with fellow Trail Dames, I could think of no better way to pay it forward than to host a series of day hikes on AT from Harper’s Ferry, WVA to Pen Mar, MD! We kicked off the trek north on June 7, 2014 in Harper’s Ferry, West Virginia. 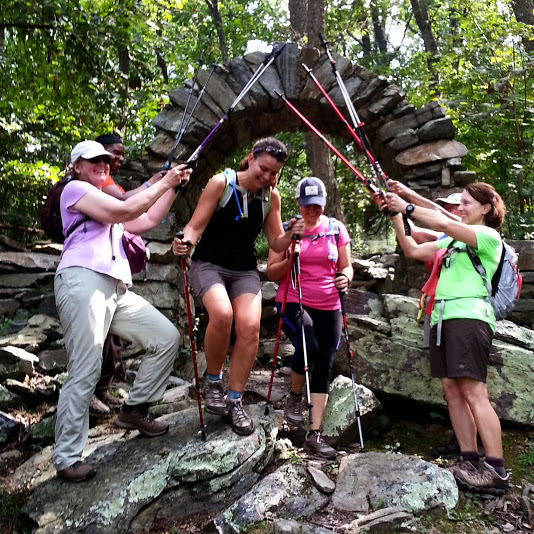 Beginnings are so exciting, especially when it is the start of something big, like completing the AT through Maryland! 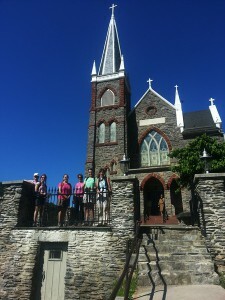 We left most of our cars at Weverton, and then shuttled down to the ATC in Harper’s Ferry to begin our hike. It was a busy morning at the ATC but Python found a break in the action to take a picture of all of us embarking on this journey north! The thing about walking through Harper’s Ferry is that there is SO much to see that it is hard to make yourself stop looking at stuff and continue to make forward progress! Good thing we are Dames who aren’t in any hurry and love to take time to enjoy the moment! 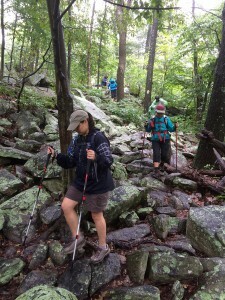 Wonderful day that left us all looking forward to the next section…which was RAINED out! Can you believe it?!! Weverton to Gathland State Park ended up at the end of the series. 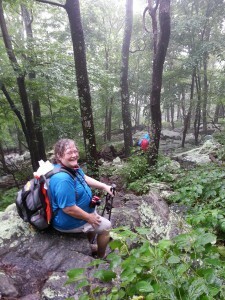 So we reconvened a few weeks later for a hot and humid hike from Gathland State Park to South Mountain Inn (Old Rt. 40). One of the Dames making the trek with us on this section was Victoria. If you all haven’t had the pleasure of hiking with Victoria aka Queen V aka Bag Lady, then you are missing out!! 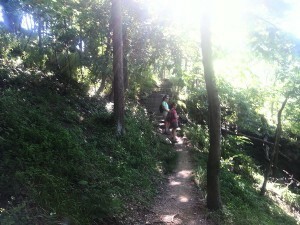 After hiking up the first hill, which rises steeply leaving Gathland, we were already breaking a sweat. 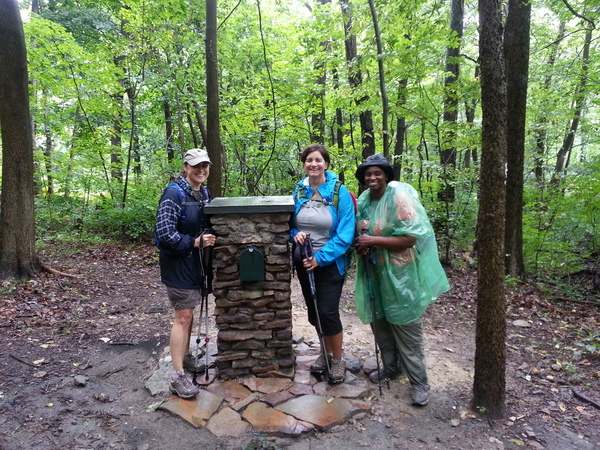 A few steps further brought us to the blue blazed trail down to the Crampton Gap shelter, the exact place where Victoria earned her trail name “Bag Lady” on another Trail Dame adventure. She was gracious enough to reenact that moment and had us doubled up, pains in our sides, laughing so hard we could barely catch a breath! 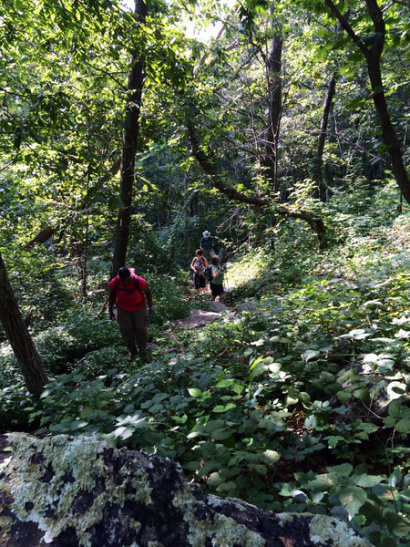 Well, with a hike that starts like that…whew! A few miles later we were taking in the hazy view from the rock outcropping at the top of Lambs Knoll, and then happily descended to the new Rocky Run Shelter for lunch. 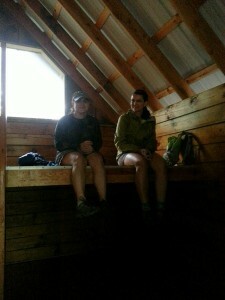 We met a thru hiker at the shelter who told us we should go down and check out the old shelter as it was his “favorite place on the AT so far”. Wow! That is an endorsement! So off we went to check it out. It was a beautiful spot with a spring flowing in full force right in front of the shelter…and (insert squeaky voice) there was a swing!!! Oh, it was lovely…thank goodness Dames are not in a hurry and enjoy being in the moment! We finished off our hike together by grabbing ice cream at the South Mountain Creamery…every hike should end this way! Shortly, thereafter the skies opened up letting loose a slew of dangerous thunderstorms in the area. We timed that one just right! 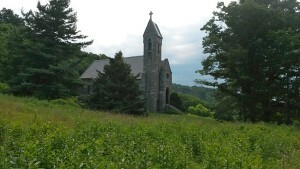 Next trek was from South Mountain Inn (Old Rt. 40) to New Rt. 40. 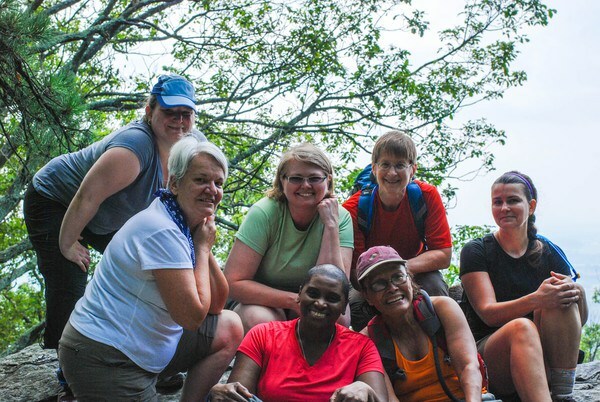 The Dames climbed South Mountain…did I say that loud enough? CLIMBED. 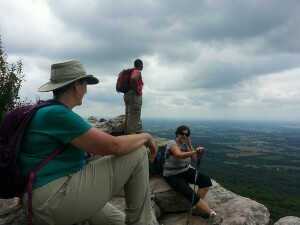 It was hot, it was humid, we huffed and we puffed and we blew that mountain down! Or something like that…the thing about writing this in late October is that I hope the Dames have now forgotten any pain associated with the hard climbs and just feel victorious in the memory! We took a break after reaching the Washington Monument at the summit. This is not the Washington Monument in Washington, D.C….just for clarification! 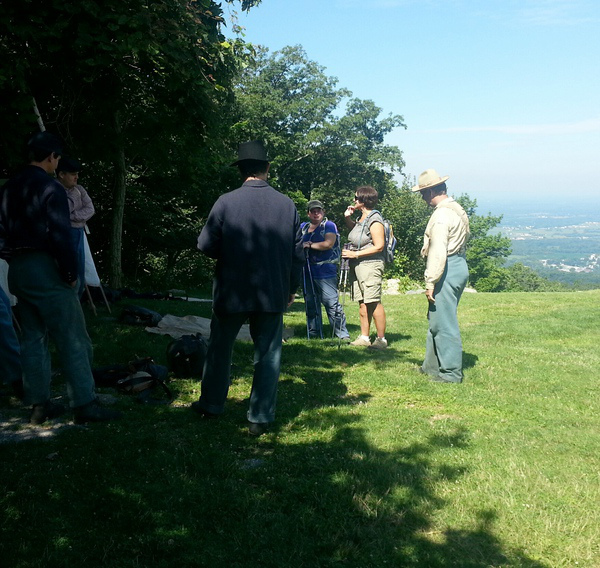 Now, just so you know…you cannot hike the AT across Maryland with learning a little bit about the Civil War. Ground zero right here! So it was not a big surprise to find Civil War soldiers hanging out in the shade and taking in the view from the top of the monument! 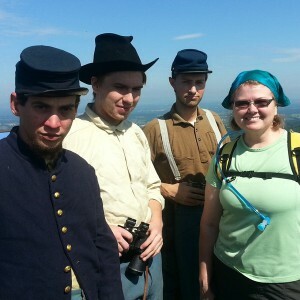 And what do Dames and Civil War Soldiers do when they get together? Take selfies, of course! Well, I think we were all feeling mighty proud of ourselves at the end of this hike. 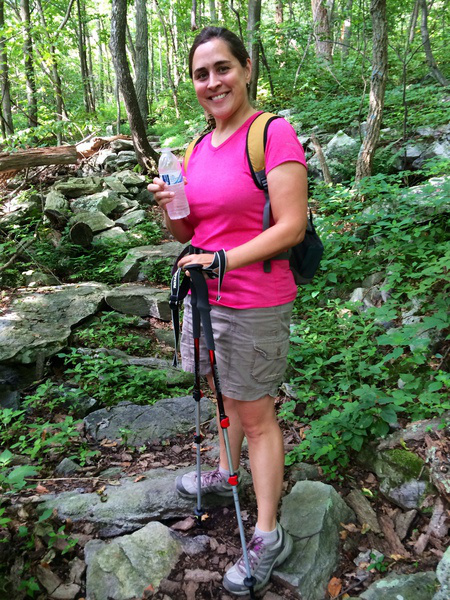 We were now half way across Maryland…Bring on the rocks! The section from New Rt 40 to Wolfsville Road has a few places that give a beating to your feet! 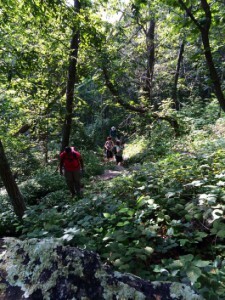 This section was a big, big change from the sections we had hiked thus far. 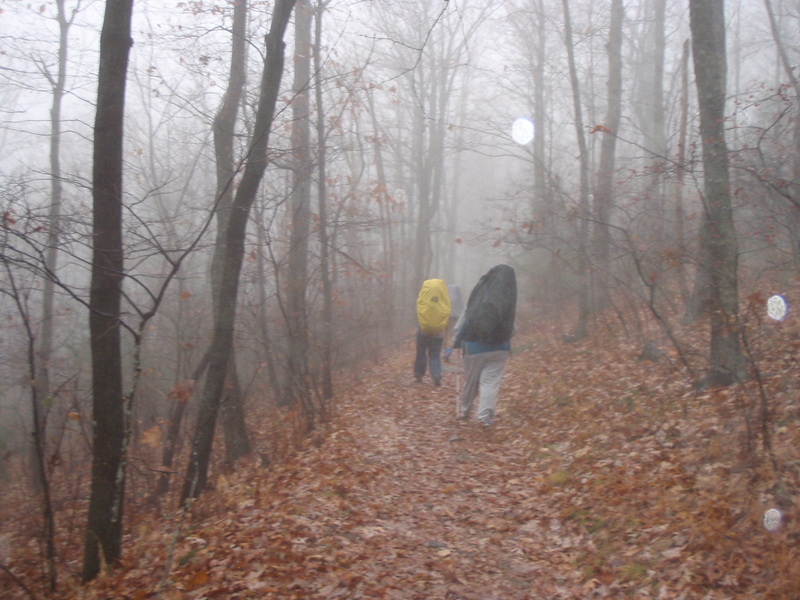 We hiked the section from North to South starting at Wolfsville Road. Now coming from either side there is quite a climb, but the Dames took it at their own pace. Hiking along the spine of the mountain it seemed like forever before we got to Pogo Campground! At the campground we gathered round a fire pit, sitting on nice stone seats, for lunch before heading up to Black Rock Cliffs and Annapolis Rocks. 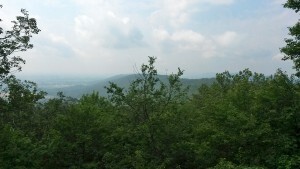 It was a lovely day to sit up on the cliffs overlooking the Middletown Valley. Returning to our cars we knew we had done some HIKING! Around 9 miles with the side trips…wow, go Dames!!! The next section was a short one from Wolfsville Road to Warner Gap, so we hiked it as an out and back hike. 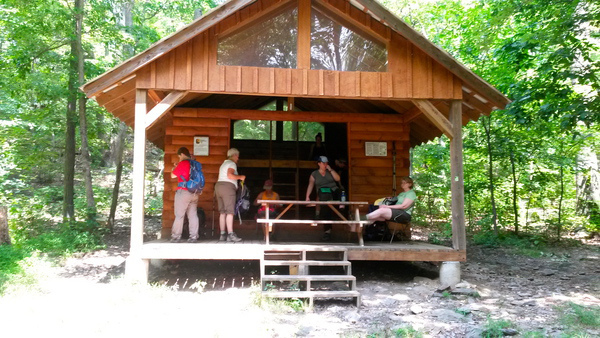 On this section we passed the Ensign Cowall Shelter and walked through a lovely field before entering the woods that would lead us downhill to a pleasant creek for lunch. Nothing better than to have a picnic and conversation in the woods with such great women! 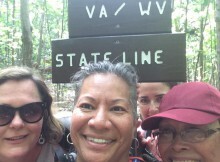 And then the final stretch to the Pennsylvania line…Warner Gap to Pen Mar. This is a fun, fun, tough section of trail! And the rain was supposed to STOP! But did it? 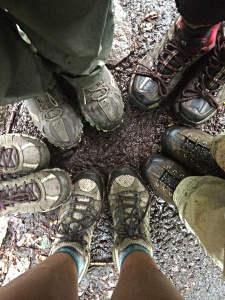 For most of the hike it drizzled, then poured, then drizzled…back and forth, back and forth. We had our ponchos and extra dry clothes! 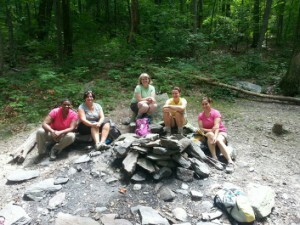 Made a stop at Raven Rock Shelter for lunch…and what a happy surprise! A backpacker had a nice fire going! Extra nice! 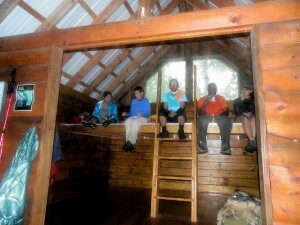 Sitting around eating lunch was great…but when we got chilly we knew it was time to get back on the trail! 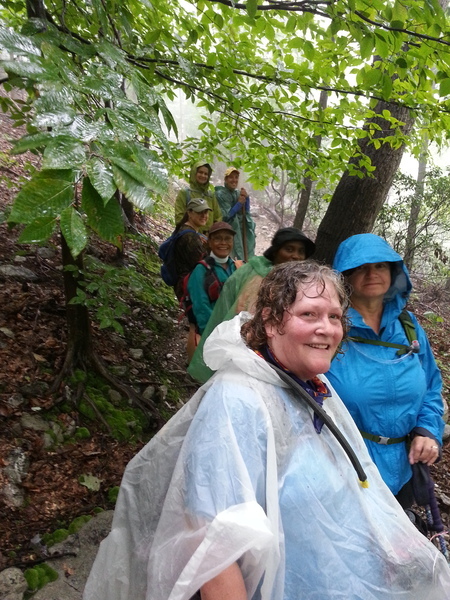 Mother Nature was very accommodating and stopped the rain for the rest of the hike…just in time for us to descend the rock pile down from High Rock! It was a long, wet day and everyone was tired as we dragged into Pen Mar. 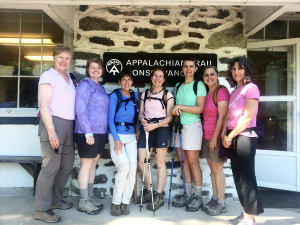 However, it ended triumphantly for us all as we celebrated Diana’s completion of the AT through MD!!! Two weeks later we were celebrating again when we finished the AT series hiking from Weverton to Gathland State Park. 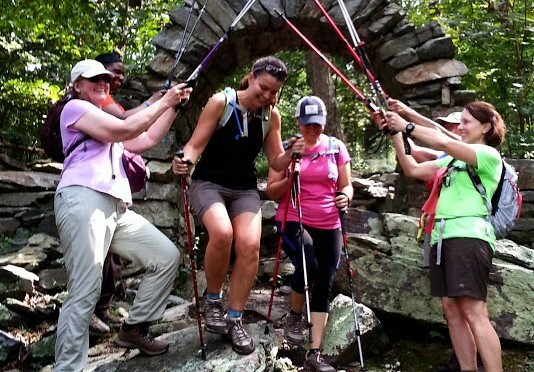 Amy and Renate walked through the arch at Gathland State Park signaling their completion of the AT through MD…Huzzah! 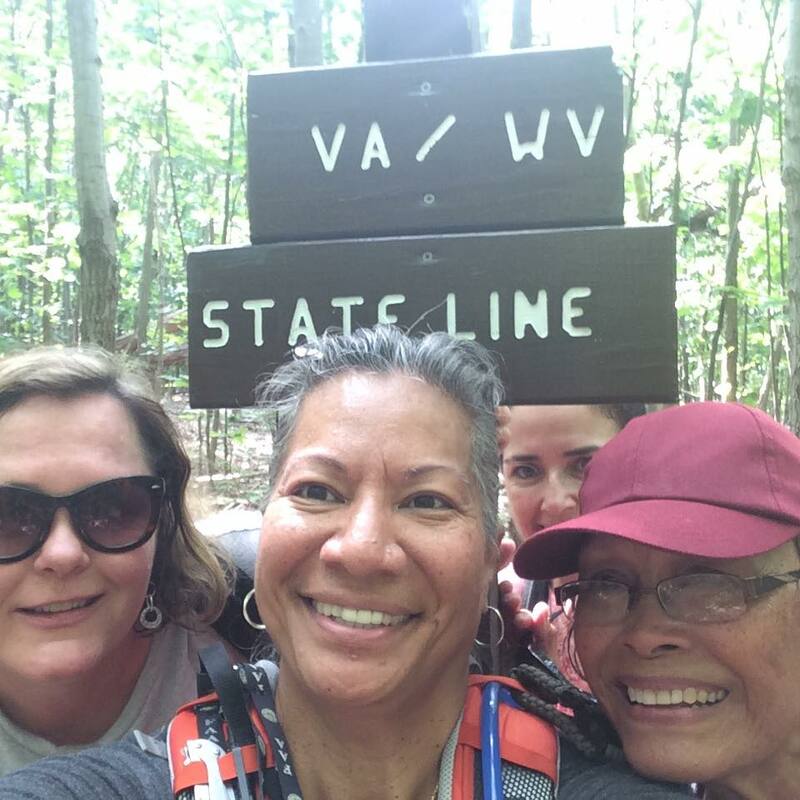 Michele Zehr is a member of the Trail Dames Board of Directors and she is also the head Dame of the Central Virginia Trail Dames. 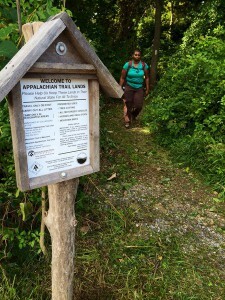 Michele’s trail name is Certain and she finished her Appalachian Trail (AT) hike in 2008. 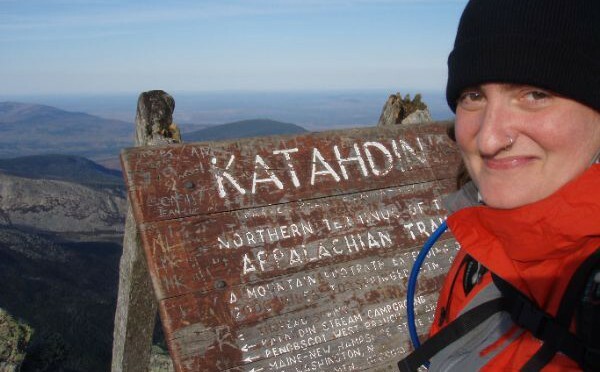 It would be safe to say that Michele has one of the most popular Trail Journals of all time. Michele has given us permission to post her journal entry from October 8, 2008 – the day she submitted Mt. Katahdin. She also has a wonderful video showing her final ascent. And I was free to breathe again.